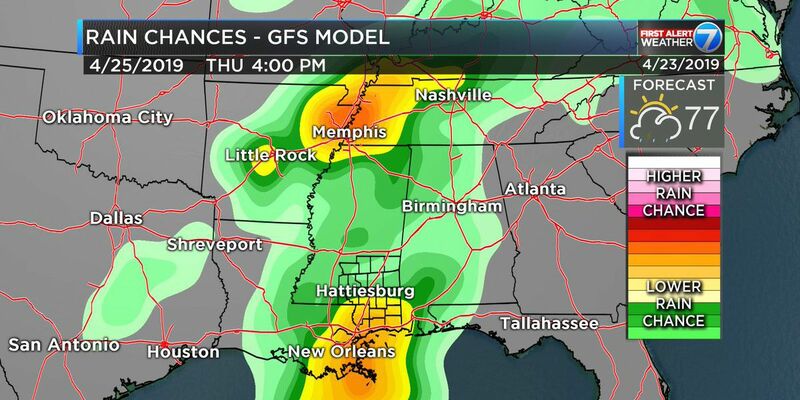 HATTIESBURG, MS (WDAM) - The storms from this morning are gone, with – thankfully – only a few reports of damage. Now, we are focusing on just how cold it will be tonight. The updated forecast shows temperatures down to around freezing tonight across the area as the cold air oozes into the Pine Belt. Sunday will start with temperatures around the freezing mark – if you are up around 7am. For those who sleep in, temperatures will likely be around 40 by 10am. Most spots, even with the sun, will only manage to eek out the upper 40s for high temperatures tomorrow. The wind will still be pretty breezy from the northwest at 5 to 15mph. Sunday night and into Monday morning we will get pretty cold again. Overnight lows will tumble into the mid to upper 20s. The amount of cold won’t be as noteworthy as the length of the cold, though. The area wil likely be below freezing for up to 10 to 12 hours overnight and into the morning on Monday. By Monday afternoon, the area will warm back into the mid 50s once the wind flips back around to the southeast. Tuesday the clouds start to increase again as temperatures climb back into the mid 60s. We will hold on to a 20-perrcent chance for rain, mainly late in the afternoon and evening. Wednesday will be the next real shot for rain. Highs will be around 60 as the rains roll through. It looks like some of the moisture with this next system could trail behind the front, too. That means we won’t have to worry about severe weather, and instead will have to watch and see how long the precipitation sticks around after the front passes by. Right now the forecast is for a cold rain, but it deserves extra attention in the coming days. Beyond that, we have another system roll through next weekend with some more cold rain and, what looks to be, a pretty decent shot of cold air again, too.